A first-time visit to America’s northernmost state likely conjures up images of hiking through dense pine forests and maybe running into a moose or a bear. Kayaking around jagged rocks and watching fishermen in yellow slickers pulling in the day’s haul complete the dream. Certainly these expectations can be met for the most adventurous travelers, but for others the state is a lot like “the lower 48,” which is how Mainers refer to the rest of the country. When it comes to dining, there’s more to Maine than lobster rolls and whoopee pies, although certainly both local favorites are easy to find. But the “foodie” city of Portland along with many others dotting the coastline increasingly offer innovative options, with hundreds of restaurants serving spectacular cuisine prepared by award-winning chefs. The trend is local, and with so many small farms in the area it’s easy to see why organic and locally grown products are so popular on Maine’s menus. From the most expensive restaurants to the lowliest of diners, eating in “America’s Vacationland” has become a high art. Here are 15 best restaurants in Maine. Located on a cobblestone street across from the harbor in the heart of the city's busy Old Port district, Street and Co. is famous for its all-seafood menu. So if fish is not your thing, stay away. But if it is, the offerings here are the best you'll find anywhere, with lobster diavolo as the star and the day's freshest catch in a supporting role. An authentic Irish pub sits right on Route 302 near Long Lake, in the heart of the Lakes District. The owner, born in Ireland, trains his staff to pour a perfect pint of Guinness, and you can't get more Irish than that. Favorites always available are clam chowder, fish and chips and salmon. Be sure to leave room for the true crowd-pleasers: Bailey's Irish Cream Cheesecake and Guinness Chocolate Orange Cake. Open for dinner only, the live Irish music on weekends adds to the festive feeling. Dining doesn't get more local than this. A farm-to-table pioneer now in its fifteenth year, you can almost choose your own dinner at Primo by taking a stroll on their farm out behind the restaurant. Chickens and pigs are on view, and with two greenhouses and several acres of produce you can see where they get their fabulous salads. What they don't grow or produce on their own comes from neighboring farms. The setting for all this culinary delight is a beautiful old home with various rooms creating lovely, intimate dining areas, a lounge/bar and a gift shop. OTTO serves up pizza worth pigging out on, and that's the truth. Thin crispy crusts and special toppings like squash, cauliflower, mashed potatoes and avocado make them memorable. The traditional toppings-cheese, sausage and pepperoni - are also available, but somehow they taste like nothing you've had before. Crisp fresh salads, wine and beer can accompany the main event, but pizza is the star. While each OTTO location has its own ambiance, the two in Portland feature rich old woods and antique tin ceilings. 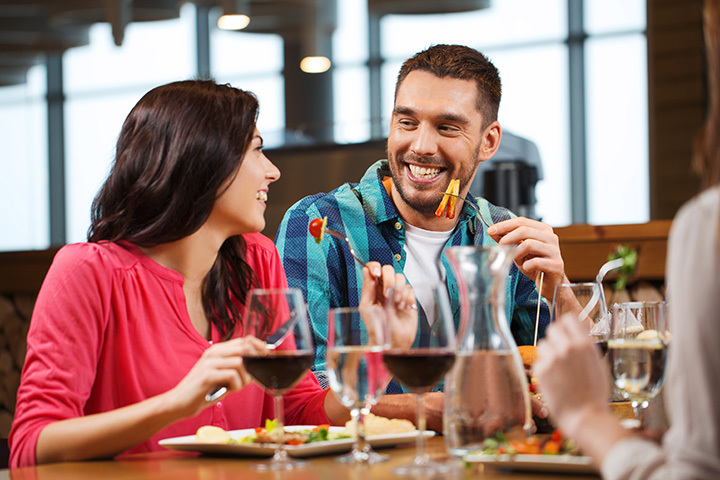 Get ready to share your food, since you will want to taste every last morsel that comes to the table. Featuring small plates laden with exotic and wild combinations, this is not your standard Chinese restaurant. Empire's loyal fans call it "Cantonese soul food." Make sure to get something starring eggplant. It is bound to be sublime. Packed on weekend nights with a typical 45-minute wait for a table, it's smarter to go for lunch when you can often be seated immediately. If you want to feel like you've really been to Maine, Moody's is a must. Besides the good, old-fashioned diner food there are lots of souvenir items you'll want to grab and take home for friends. A great value for the money and a good stopping place on the drive to northern vacation spots, make sure to leave room for key lime pie. Known locally for its outstanding wine list and an eclectic menu that changes with the seasons, you can always count on a great, organic burger and a lively chat with Vinnie, the gregarious owner. The small kitchen makes waiting for your food a sure thing, so opt for an appetizer to stave off hunger. The mussels are always fabulous. Five miles down the road from L. L. Bean, this local gem sits right on Route One at the foot of the iconic sculpture dubbed 'The Big Indian," one of Maine's most historic landmarks. There's more to Maine than lobster, and Buck's proves it. Start with a Bloody Mary with a giant beef or pork rib on top to get you in the mood, and keep going. Full dinners of ribs, chicken, brisket, pulled pork and fried catfish come with your choice of sides. Opt for the memorable coleslaw, fresh corn bread and surprisingly good Caesar salad. Live music on weekends makes it noisy but fun. The quintessential lobster shack on the water at the Town Wharf, it's best to arrive before six for dinner or be ready to wait in line. Go for the classic whole lobster with steamers and corn on the cob, or choose a lobster roll or fried fish basket, all served with slaw and fries. For a real treat and diet-buster, the battered, deep-fried onion rings are worth waiting for and, by the way, addictive. Burgers are available if red meat is your thing, but alcohol is not served so bring your own beer or wine if you are so inclined. Serving only Black Angus beef, which is the "most tender, juicy and flavorful" kind according to the USDA, Joseph's is a true carnivore's delight, although tasty vegetarian options are also available. The wood-paneled rooms with wide-plank flooring, a row of TV screens over the bar and two large fireplaces make for a cozy, ski-lodge feel. Located near Colby College, the year-round outdoor dining deck has views of the adjacent golf course. Located in a historic mill that also houses two vast antique malls and many art studios that are often open to the public, a visit to Frontier offers more than just food. The spacious interior's brick walls showcase art by local professionals, much of it for sale. A wide-ranging menu of American cuisine focuses on local produce and organic meats. Adding to the fun is an in-house theater that offers indie films, live music and comedy. And you can bring your food and drinks right into the theater as there are tables for your convenience. Tucked on a side street off the main drag, this quaint bistro is a favorite with the locals as well as the hordes of tourists who descend on Camden, a lovely small town called "The Jewel of the Coast." A worthy wine list, unusual craft cocktails and incredibly prepared chicken, halibut and oysters are among the most cheered aspects of Francine Bistro. Small and thus noisy when it's busy, which is almost all the time, it's a perfect destination for a romantic twosome, less so for large groups. A good breakfast is a must if you plan to bike the carriage roads in Acadia National Park or hike up Cadillac Mountain, and this is the perfect place to fuel up for the day. The house-made biscuits, strawberry butter and organic coffee are outstanding, and the lobster omelet, wild Maine blueberry pancakes and corned-beef hash all pack enough carbs to keep you going until dinner. Expect to wait a while for a table since the dining room is small. Five-O's James Walter was named 2016 "Chef of the Year" by the Maine Restaurant Association. That's quite a compliment in a "foodie" state crammed with dining options. Go for dinner or brunch, or possibly both. Catering to tourists sometimes may lead to rushed service, but the food here is always outstanding. By all accounts, the clam chowder is among the best you'll find anywhere. If you have to wait for a table, leave your cell phone number and the hostess will call you while you wander the town's interesting shops and galleries. A broad menu of all the usual suspects is brightened by the famous Jordan Pond popovers that are made on the premises. They live up to the hype and you will want several. Also outstanding are the lobster stew and lobster roll. Lunch on the lawn offers fantastic views, as does a walk around the property while you are waiting for your table. Like all tourist meccas in "America's Vacationland," you likely will have a long wait, giving you time to cruise the extensive gift shop.